Tunnel Cukes at ICF Started Week 2 of Summer Pick-ups! 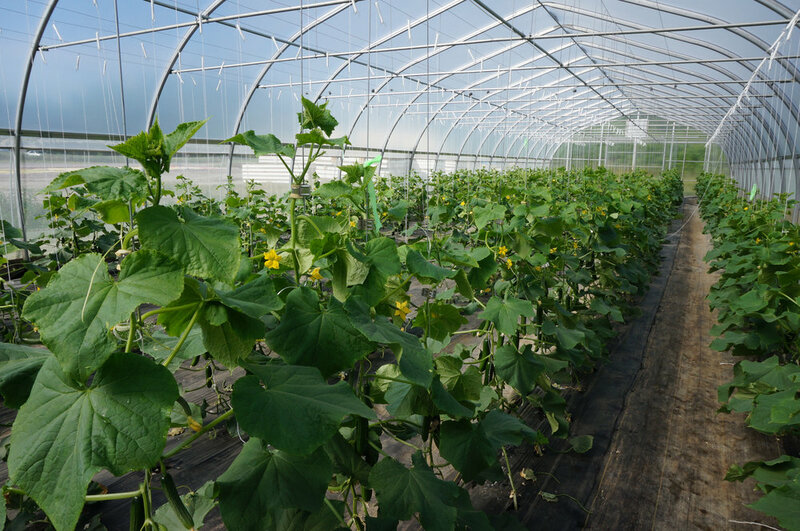 In 2015, we planted about 25 greenhouse cucumber plants in our high tunnels at the end of our tomato beds. We were extremely surprised and pleased with the fruit (thin-skinned and delicately flavored), first harvest date (approaching the first week of summer share pick-up) and overall yield (an incredible bounty from so few plants). The following year, we took the next step and planted half of one of the high tunnels in cucumbers. Unfortunately, we did not predict the level of infestation and damage from the cucumber beetle that plagues our field production of the cucurbit family. The delicate skin of the greenhouse cucumber is easily scarred from the feeding damage, leaving a portion of them unsalable. But, we saw the potential. In 2017, we decided to up our game. Before we planted, we installed a fine mesh insect netting to prevent the cucumber beetle from finding our plants, which worked flawlessly. We also increased our planting from one half to an entire house because our membership loved the thin-skinned cucumbers from the previous year. 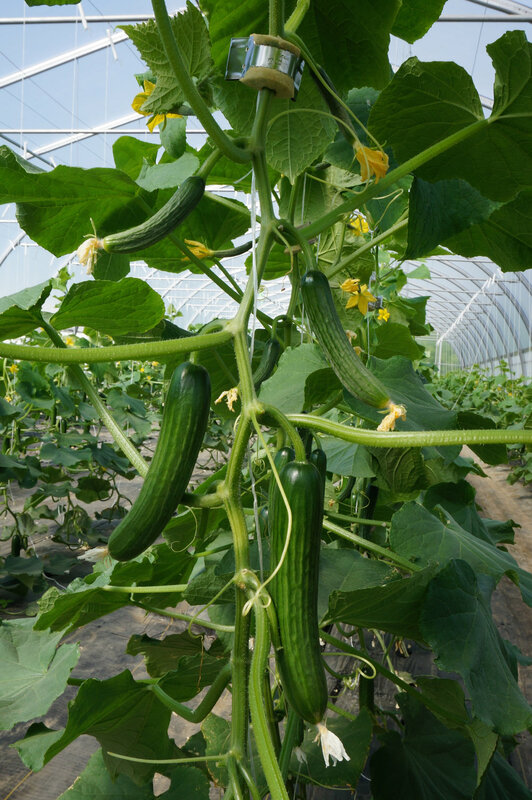 Overall, the yields from the house were substantial and provided the membership with an early and consistent supply of delicious cucumbers which is often lacking because the quality of the first planting of field cucumbers can vary tremendously based on conditions. However, the downfall of this house was a complete infestation from the Two-Spotted Spider Mite which is a known pest to greenhouse cucumbers. Ultimately, we had to abandon this planting because the damage to plants and fruits was too severe. Fortunately, we had two field plantings in full production so we did not miss a week of cucumber distribution at pick-up. These greenhouse plants are bred to be parthenocarpic which means that they do not need pollinators for fruit production and are well suited to be trellised and pruned in the same way that we manage our tunnel tomatoes. This year, when we planted our cucumber house in the middle of May, we put out pots of bush beans which are particularly attractive to spider mites. Less than one week later, we found our first spider mite and promptly ordered our first round of predatory mites to control the population. This past week, we ordered another round to control some localized outbreaks. We will continue to monitor their progress. So far, the harvests have been bountiful and the production is picking up. We are looking forward to a long harvest window and many summer dishes with these delicious, delicate cucumbers.